Add a touch of modern to your bedroom, living room or office with this elegant looking eco-friendly wooden vase with voice control alarm clock function that matches perfectly with any modern designed office or home furniture. Designed with simplicity and elegance in mind, this vase makes an ideal gift for your loved ones for any occasions such as Valentine's day, Christmas, birthdays, anniversaries, mother's day, graduations, etc, or when you simply want to spoil yourself with something new and trendy. It displays time, date, humidity and temperature clearly with bright and adjustable LED lights for a clean yet modern look. The upper front side of the vase is magnetic, and a matching color small magnet is included so you can stick a favorite photo, important note or card to the vase. And for your convenience, you can set up to 3 alarms in a few minutes intervals to replace the snooze function. The vase clock works on dual power mode, it can be plugged in via the included USB cable and wall AC adapter, which is the main power source, or backed up by 3 AAA batteries (not included). Important Note: Please note this product is constructed with wooden composite material which requires it to be used in a dry environment. Water or liquid spilled inside the vase will cause permanent damage to the device. Please use the plastic container included inside as the vase with water for live flowers, but precautions like putting a layer of paper towel between the plastic container and the wooden interior should be exercised to make sure there is no spillage of liquid inside the vase. 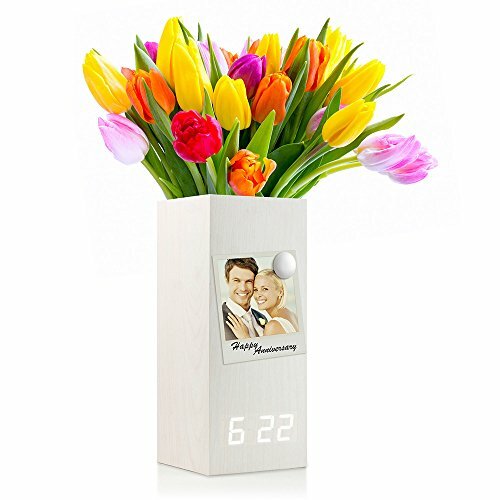 VASE WITH DIGITAL & ALRAM CLOCK FUNCTION: A wooden vase with digital alarm clock functions that displays time, date, temperature and humidity with adjustable bright and clear LED lights. Displays time in both 12h / 24h format, and shows indoor humidity and temperature in both Celsius and Fahrenheit. Up to 3 alarms in a few-minute intervals to replace the snooze function, select different alarm types between daily alarm and weekday alarm, each alarm rings for 1 minute. DUAL POWER SUPPLY: this alarm clock works on mains power or 3×AAA batteries (NOT included). Power cable and wall AC adapter is included in the box. Cable compatible with all USB chargers. CAUTION: Product to be used in dry environment only, water or liquid spilled inside the vase will cause permanent damage. Please use plastic container inside with water for live flowers. We recommend putting a layer of paper towel between the plastic container and the vase interior. VASE ONLY, FLOWER DOES NOT INCLUDED. If you have any questions about this product by Oct17, contact us by completing and submitting the form below. If you are looking for a specif part number, please include it with your message.